We understand that buying Super Bowl Tickets can be stressful and difficult. To make it easier we’ve created a Frequently Asked Questions (FAQ) page. 1 Where will my Super Bowl tickets be available for pickup? 2 When can I pick up my tickets? 4 What Items Can I Bring Into Mercedes-Benz Stadium? 5 Where are Zone Seats i.e Lower Endzone, Corner, etc.? 6 Can Super Bowl tickets be shipped? 7 What is the best way to get to the Super Bowl? 8 Why do some seller notes say "ship by?" 9 When should I buy Super Bowl tickets? 10 what will the setup in atlanta be for super bowl liii? 11 Is TickPick a trustworthy site to buy Super Bowl tickets? Where will my Super Bowl tickets be available for pickup? 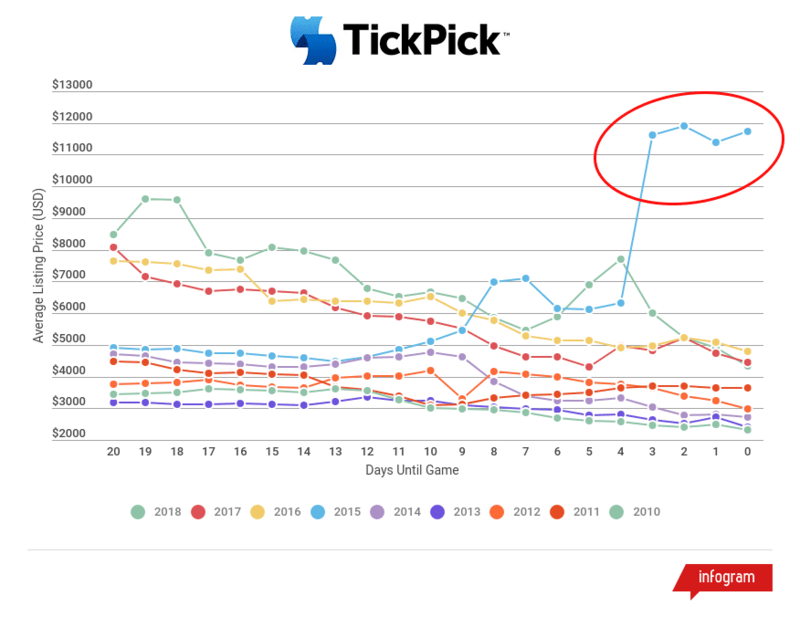 All Super Bowl tickets bought from TickPick will be available for pickup in Atlanta. For security purposes, the exact location will not be released until after you purchase tickets, in the week leading up to the Super Bowl. Tickets will be available for pickup on Saturday or Sunday the weekend of the Super Bowl. If these times do not work you please contact TickPick Support to make other arrangements. Atlanta is well known their traffic, making ride-share services a less appealing option for getting around. Marta, Atlanta’s public transportation system, is one way to avoid the traffic. Scooter-share companies have been flooding the city recently, which can be a nice option if you are traveling within the downtown area. What Items Can I Bring Into Mercedes-Benz Stadium? At the Super Bowl, security will be tight and fans will be required to pass through a metal detector before entering the stadium. Check out the Mercedes-Benz Stadium website for more information on what is permitted inside the venue. We’ve compiled what items and behaviors are prohibited at the venue. • Large Umbrellas – Must be under 33 inches to be allowed in the building. Where are Zone Seats i.e Lower Endzone, Corner, etc.? Many sellers have access to Super Bowl tickets but are not told the exact location until much closer to the game. Instead, they are given a zone, which is an area of sections that the tickets will be in (Note the key below). See our Super Bowl Seating Chart Guide which includes details regarding all of the zone sections. Can Super Bowl tickets be shipped? Unfortunately, no. With FedEx or any other shipping option, we would risk the loss of tickets which cannot be reissued. Over many years we've found that local pickup is the safest approach for both TickPick and for the fan. What is the best way to get to the Super Bowl? This really depends on where you are coming from. We'd advise taking the Marta when possible. Why do some seller notes say "ship by?" In the seller's notes you may see someone say tickets will ship by 2/3/19, that is just standard terminology; the ship date is the date which your tickets will be available for pickup from TickPick. When should I buy Super Bowl tickets? That's a great question. If you are trying to figure out the best time to buy Super Bowl tickets, you should sign-up for our Super Bowl Ticket Update Newsletter. what will the setup in atlanta be for super bowl liii? 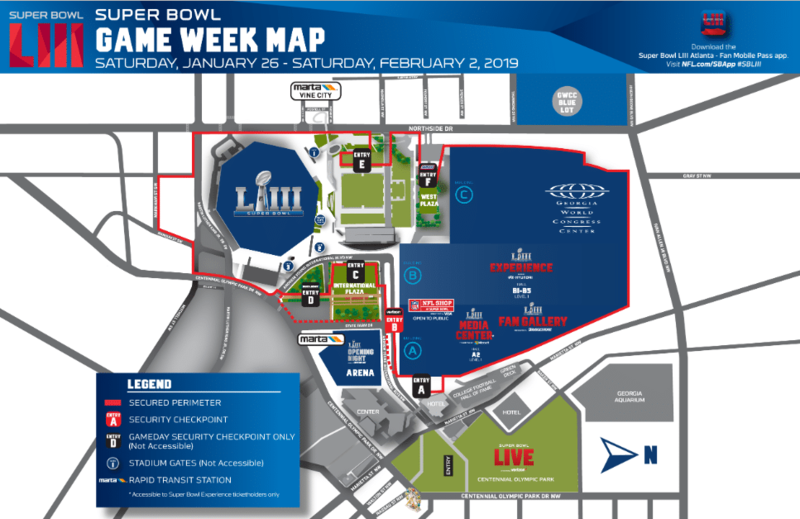 Check out the graphic below that shows a map of the entire Super Bowl Game Week locations and perimeters that you should know about heading into your trip to Atlanta.You may also click here to be able to zoom in further.